« To The Food Forest! 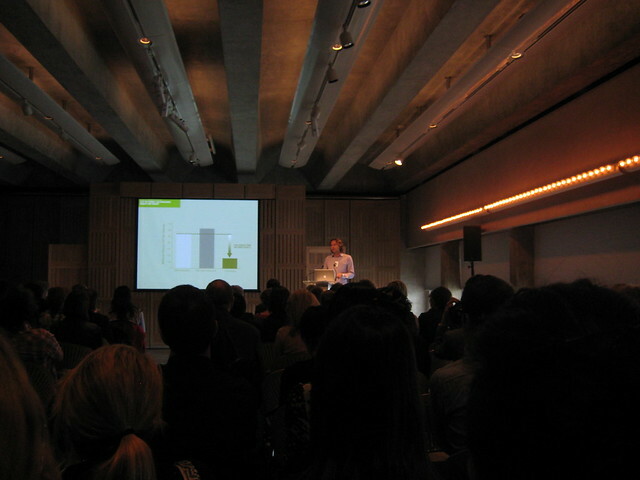 Last week I attended the Hothouse Symposium at the Sydney Opera House. One highlight for me included a talk by Bruce Taper from Kinesis. In a rather mythbusting presentation, Bruce told the story of advising City of Sydney for their 2030 sustainability campaign. Actually, I’d like to get hold of his slideshow, because it was quite powerful in its demonstration that the goal announced by various governments of cutting greenhouse gas emissions by “whatever percent by whatever date” is often – in a word – impossible. He also criticised the BASIX building sustainability index, which gives a green rating to buildings and appliances in NSW. In many cases, Bruce said, new buildings with a five-star rating still end up with a much greater environmental footprint than older buildings which were constructed before the rating system even existed. We have to be wary of these external accreditation systems which end up being hollow gestures: commerce-friendly badges and ‘eco-bling‘ trophies. I was also struck by Tony Fry‘s keynote talk. What strikes me as interesting in Tony’s approach is that, as a design educator, he’s not getting his students to make ‘green friendly’ products. Rather, he’s been training them up to be ‘disaster ready’ – planning for the reality of the future world to come (a rather grim world it seems) where millions of climate change refugees (especially, in the early stages, from low-lying Bangladesh) are “unsettled” from their homelands, consequently unsettling the comfortable lives of wealthy westerners. How ready are we to adapt ourselves to a new way of living? Tony’s provocation stands in contrast to many of the other presentations during the conference, where works by artists and designers were held up as exemplary green+aesthetic actions. In my more apocalyptic moments, I have to admit to a fear that these polite product designs are just ways of making us feel better about ourselves while the good ship Mother Earth goes down… (Tony’s encapsulation of the role of art in the era of climate change is this: “Futile gestures feeding the illusion of agency”). But I know that this, too, is an extremely pessimistic, and perhaps not very helpful way of thinking about what creativity can offer in this period of “long slow emergency“. There’s plenty more that could be said about individual speakers. But I now want to spend a little time considering the organisation of the conference as a whole. The name “Hothouse” obviously refers to the greenhouse effect and its role in the rise of global temperatures. According to the organisers, the term also positions this symposium as a kind of “think tank” – an exciting coming-together of key players and thinkers in the world of sustainability, art and design. A chance to have a good old pow-wow about “this big problem” the world is facing. HotHouse brings together artists, designers, curators and creative thinkers in a quest to develop models for sustainable environmental change. This “collective experiment” calls upon art and design to offer practical means of transforming spaces, environments, and even cities in ways that are enduring and energising, and that, most importantly, engage all sectors of the community. The use of this kind of language for publicity irritates me. Having actually attended the symposium, it must be said that to describe what went on as a “collective experiment” is just plain wrong. Rather, it was an old-skool conference, where People with Expertise stood up and talked, and we The Paying Audience sat down and listened. There was an excess of material timetabled into each day, and many speakers went well beyond their designated time. So… given the finite time available, which aspect of the event do you think got the chop? Precisely – the allocated sessions for public discussion – which were deleted, in exchange for a single short “plenary” session at the end of the second day. In this sense, this event followed a standard top-down template based on an old-fashioned model of education – the broadcast approach – the transmission of information by the one to the many. Many members of the audience I spoke to at the conference expressed frustration at not being able to participate in the public discussion, except for the “off the record” chats during the brief lunch and tea breaks. Why am I banging on for so long about this methodological failure? Well, one of the main goals (I think) of my Environmental Audit project is to think about the relationship between means and ends. 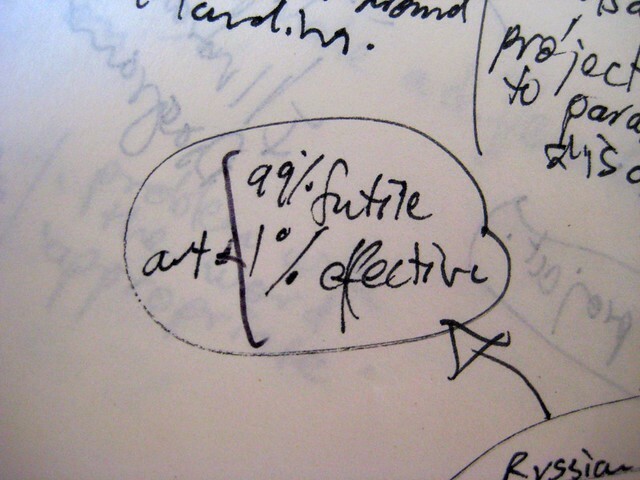 Finding a way of doing things – aesthetically and ethically – which integrates with a perceived goal is not easy. So when you organise a conference which allows no structured participation from 90 percent of the attendees, it makes you wonder whether the goal really is to create a “Hothouse” think tank, or whether the actual goal might have been something else. In defiance of the symposium model, Tony Fry (in collaboration with Tessa and Karl from Makeshift), actually organised his own unofficial “break out session”. About ten of us gathered conspiratorially in the foyer of the Opera House, playing truant during one of the official sessions, to share our thoughts about the ideas we’d heard so far, and to forge closer connections with each other. It was a striking interaction – for the first time I found myself looking into the eyes of my fellow conference travellers, rather than at the back of their heads as I craned my neck to see the powerpoint presentation. This entry was posted on Tuesday, August 3rd, 2010 at 12:38 pm and is filed under auditable events. You can follow any responses to this entry through the RSS 2.0 feed. You can skip to the end and leave a response. Pinging is currently not allowed. Hothouse at the Opera House was but a start of an ongoing project intended to stimulate multiple levels of experiments, which won’t all be “managed” like a talkfest. In this opening event, the program was constrained by time and we were unable to formally timetable breakouts in a venue like SOH — any good conference/ symposium program should prompt informal discussion. No “defiance” necessary, if you got together with Tony Fry and Tess and Karl, that’s a good outcome for us. We think it was worth bringing all these speakers together. Practical/workshop projects will follow. The key question is – what happens after. Will those who did not get to air their views share them on the online platform of the Post symposium discussion zone http://www.hothouse.unsw.edu.au? Perhaps you’d like to lead the way and stay connected. Well, it’s good to know that the next stages of the program will be more participatory. I guess part of my criticism was based around the old adage, “Start as you wish to proceed”. Thanks for the feedback. One minor correction, BASIX is good and stars are bad. In short BASIX measures total greenhouse in a clever way, whereas the Star policies are both inadequate and inappropriately applied. UPDATE: Michael, an environmental worker from Western Australia, came and visited me at the MCA last week. He sent through a few links which shed light on the ratings systems. You can read his comment here. In its review of five homes from South Australia to Darwin, the University of Adelaide study reported: “In terms of the community benefit, they are using less energy than is considered normal for houses in their respective locations.